Aluminum panels are used primarily for protection from traffic noise. More and more often, aluminum panels appear in industrial areas. 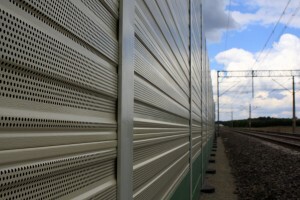 Noise barriers are installed having the acoustic comfort of neighboring buildings in mind. Aluminum panels are manufactured in several variants with insulating properties adapted to the sound source. The structural element of an aluminum panel is constituted by bilaterally-mounted profiled metal sheet with a thickness of 1.0–1.5mm. The metal sheet is mounted to special profiles by means of aluminum rivets. Depending on the panel type (uni- or bilaterally absorbing and reflecting), metal sheets are installed which are perforated on one or two sides with holes 8mm in diameter, or with no perforation. The element filling the aluminum panel is mineral wool with a thickness of min. 90-100kg/m3, acting as an insulating and sound wave-absorbing element. Aluminum panels are characterized by various acoustic properties, depending on the panel type. The specific insulating power of a bilaterally reflective panel is DLR=21 dB, unilaterally absorbing DLR=27 dB, and bilaterally absorbing DLR=28 dB. The sound absorption coefficient of a unilaterally absorbing panel is DLα=16dB, whereas for a bilaterally absorbing panel DLα=14dB. Aluminum Panels are adapted for any given spacing of poles up to the span of 5000mm (optionally 6m on request). Aluminum Panels are manufactured with the standard height of 500mm. Multiplicity of this dimension makes it possible to build noise abatement walls of any given height. Considering the materials used for making all of the Aluminum Panel’s elements, no additional anti-corrosion coatings are necessary. Paint coatings have an aesthetic function contributing to the attractiveness of an Aluminum Panel. The wide range of standard RAL colors, as well as non-RAL colors, provides a lot of freedom in the selection of the Aluminum Panel’s coloring, which can make it unique.